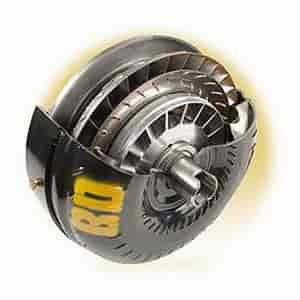 BD's 7X torque converters out pull the rest, whether it's towing or racing! BD's X-stator is machined from a solid piece of aluminum. They manufacture the stator with fin lengths, angles and curvitures designed to meet the torque of the 5.9L Cummins, which makes a great 140 to 600 HP hauler or racer. A double clutch, surfaced piston was designed to replace the stock single clutch surface to meet the engine's torque right up to 1400 ft/lbs and heavy loads. It has been tested to 900 ft/lbs of torque when pulling a 26,000 lb load up a 6% grade and on race trucks with over 1400 ft/lbs of torque that attain 11 seconds in a 1/4 track. The heavy billet front cover was built for the double clutch surface piston and to prevent the cover from over heating, warping and ballooning. A special clutch mating surface was designed into the cover that results in high torque holding power. No lock-up clutch slippage, which can plug transmission control ports. Note: Price includes a refundable core charge. Core must be shipped directly to BD Diesel in original container with in 30 days for core refund. Core charge will be refunded by BD Diesel after core has been received. Core return instructions are included with product, see product description for details. Does BD Diesel 1070215LX fit your vehicle?